Stir up the fun while you give kids and families the ingredients for fire safety done right! Kids have such a blast devouring every kitchen safety tip Sparky® and his relatives can serve up! 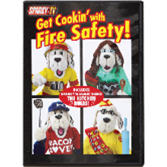 First up in NFPA®'s Sparky's Get Cooking with Fire Safety Video is Safety Scout Steve, a junior fire dog in training who interviews a real chef to learn the rules so he can earn his kitchen fire safety merit badge. Proper distance young children must keep from the stove. When it's okay to use a microwave. Safest way to open containers with hot food. What to do if you do get a burn -- and who to ask for help pronto! Order this fun-filled video today! It makes a great tool for helping fire safety come alive at station open houses, and community outreach activities. It has all the right ingredients to encourage kids to get cookin' with fire safety! Watch a clip from the video below! This video can now be accessed through our online streaming service. 30-Day Online Access -- The 30 days of access begins the first time you watch your video. You can watch your video an unlimited number of times within 30 days. IE8 and IE9 are no longer supported by Microsoft, make up a tiny fraction of Brightcove's* traffic, and are therefore no longer actively supported. Brightcove will consider fixing issues related to these browsers on a case-by-case basis. *NFPA is using Brightcove, an online video hosting platform and online video player solution for all our streaming video products. Android Native Browser 2.3, 4+ The Android stock browser is not actively supported by Google, and it is being replaced with Chrome on most Android 4.0+ devices. Chrome Mobile (Android) Latest Android 2.3 has passive support.